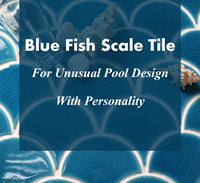 If you are tired of using square or rectangle mosaic tile for swimming pool design, try to consider a special shape - fish scale/fan shaped. 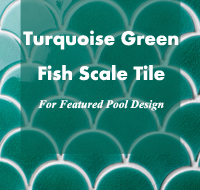 Today we share our turquoise green fish scale tile used in pool as well as other interior space. Read on and get inspiration. 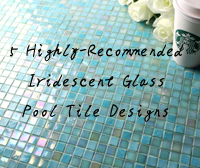 Glass mosaic tile is really durable, its surface is non-porous and low water absorption, ideal for wet environment, and comes in wide range of shapes and colors. The transparent surface adds dimension and iridescence that stone or porcelain cannot give. 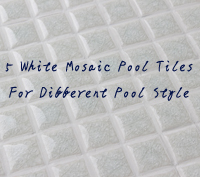 If you are tired of using blue or green mosaic tiles for pool covering, try to consider white mosaic pool tiles, which is ideal for creating a different pool style for you. 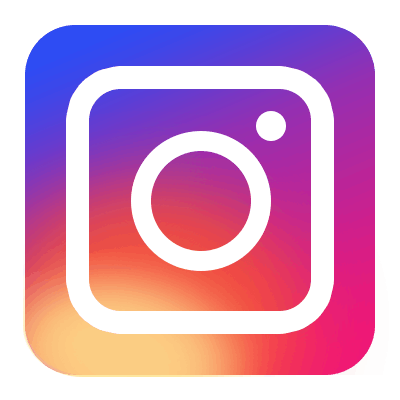 You must be familiar with all classic pool tile form such as square, rectangle, subway, penny round or even hexagon shapes. But do you consider another design, the one that few used but with lots of personality, like fish scale tiles? 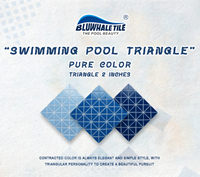 Triangle mosaic tiles is a creative and well-like product line of Bluwhale Tile, a collection including both triangle ceramics and glass mosaics in pure color and playful geometric patterns. And today, we would like to recommend you 3 triangle glass tiles in blue color, which will give an entirely different style from triangle ceramics.